Bearded dragons are popular pet lizards with some unique behaviors, such as head bobbing, waving, and doing pushups, that people often find endearing. Not all of these behaviors indicate that the reptile is happy, however. In the case of a behavior known as glass surfing, it's not cute at all. Instead, this is a common sign of stress. Fortunately, if you can discover the source of your reptile's stress, you can change the situation in an attempt to stop the behavior. What Is Glass Surfing in Bearded Dragons? When a lizard is trying frantically to climb up the side of its glass tank over and over again, it's said to be glass surfing (also known as glass dancing). Glass surfing looks like it sounds—your lizard's belly is rubbing on the glass of its tank, and its little legs are paddling as if it's body surfing on the glass. You'll also notice that your lizard is standing on its hind legs as though it's trying to climb out of the tank, but it keeps slipping back. Why Do Bearded Dragons Glass Surf? Reptile forums are often filled with pet owners who offer up theories as to why bearded dragons glass surf. While these vary greatly, there's one common thread: Each is attributable to stress. An enclosure or tank that's too small for your pet. More than one bearded dragon. Even if they're not housed together, the sight of another reptile may be interpreted as competition. New decorations or rearrangement of the vivarium. Feeling threatened by its own reflection in the glass. Suboptimal substrate, lighting, or temperature. Any one or a combination of these conditions may cause your bearded dragon to become stressed out, which, in turn, may prompt it to glass surf. 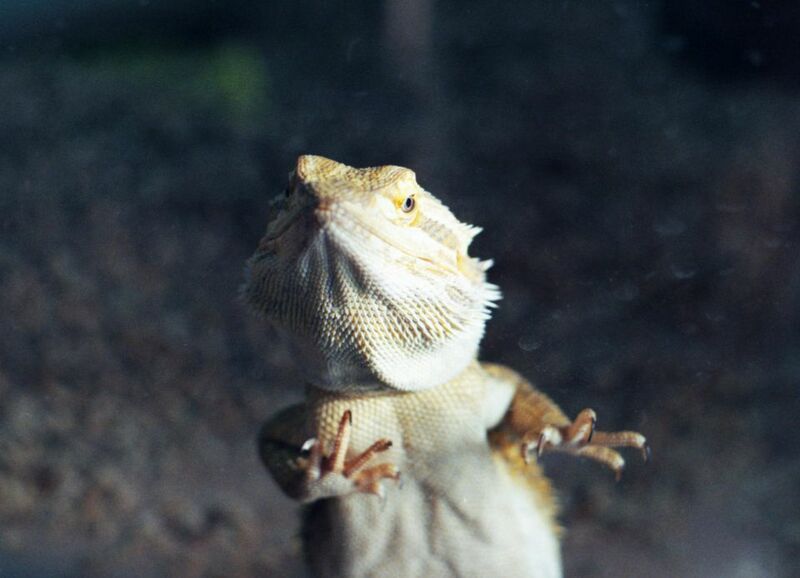 Glass surfing isn't exclusive to bearded dragons, though. Many pet reptiles and even fish glass surf when they're stressed because of many of the same reasons. Aside from glass surfing, if your bearded dragon's color darkens or turns black (typically, this is most obvious on the beard), it's probably stressed out. If you notice that your bearded dragon has a black beard, try to recall any recent changes that involved your pet. Even if you thought something would improve your dragon's life, it may have had the opposite effect. For instance, changing the location of the enclosure, moving your dragon to a new tank, or placing a new bearded dragon in a location where your original dragon can see it all have the potential to cause stress for your pet. It could also be something as seemingly unlikely as the person who regularly cares for the bearded dragon leaving for a week's vacation. You may dismiss it as insignificant, but your bearded dragon may see it as a monumental change that it doesn't know how to deal with. Other than the fact that your bearded dragon is probably stressed, there's no medical reason to be overly concerned about glass surfing. However, if your dragon isn't eating or shedding well, begins to act lethargic, or you suspect it may be sick for any other reason, you should seek help from your exotics vet as soon as possible. Since bearded dragons glass surf when they're stressed, it can be difficult to stop the behavior if you can't pinpoint the source of the stress. You don't want to make any unnecessary changes in your dragon's environment that could cause more stress. At the same time, you do want to make changes that may decrease or reverse the stress. It's a tricky business, so think over your approach carefully before taking action. If something new recently triggered the glass surfing behavior, do your best to put things back to the way they were before it started. This may mean removing a new decoration from the tank or making sure your bearded dragon can't see the new reptile you bought at the reptile show. If your tank is smaller than 55 gallons and you have a full-grown bearded dragon in it, the tank may be too small. Think about getting a larger tank because the small enclosure could be the reason behind the glass surfing. If you switch tanks, do your best to situate the environment so it's as familiar as possible. Place things in the same general location as they were in the original tank. It may be more spread out, but with as few changes as possible, it may still convey a sense of home to your bearded dragon. Your bearded dragon may also just need more attention or stimulation if it's glass surfing. Make sure you provide plenty of daily enrichment for your pet. If it likes to be handled, this could mean more time outside the tank, for example. Finally, make sure your bearded dragon has appropriate lighting, humidity, and ambient temperatures to keep it happy and healthy. Inappropriate day and night cycles, incorrect temperatures, and environments that are too humid or dry can all contribute to stress in your bearded dragon as well.